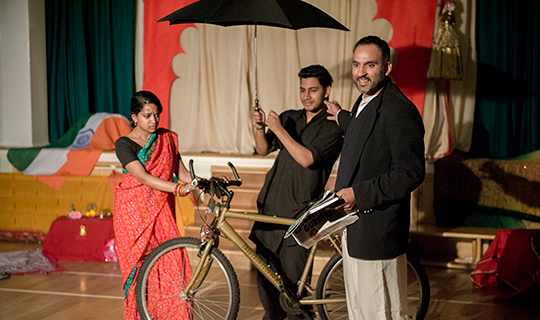 Surya's Story is a Theatre-in-Education performance for junior ages. It is a multi media piece. The performance looks at the issue of Fairtrade and the Rights of the Child through the story of ‘Surya’ a little girl who sews footballs in a rural village in Rajasthan, India. The drama explores the exploitation of children by the Wests need for cheap products and food. Most young people enjoy football, but do they ever think where those footballs come from? The theme of football is a wonderful way to engage an audience about environmental issues. It encourages young people and adults to think about their responsibilities locally and globally. The audience make connections with their consumerism and the plight of working children. The play is followed by dynamic workshops. In tamdem we have another play Jardeep and Jazz love Dancing for pre-school children and reception.